We’d love your help. 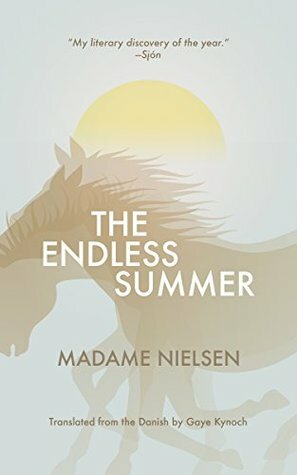 Let us know what’s wrong with this preview of The Endless Summer by Madame Nielsen. An actor, musician, and novelist, Madame Nielsen is one of Denmark's most daring artists. A finalist for the Nordic Council Prize, Nielsen is most well-known for "dying" in 2001 and trying to live in Denmark without any identity papers. In addition to The Endless Summer, Nielsen has released another novel (Invasionen) and an album (We Are Multitude). To ask other readers questions about The Endless Summer, please sign up. Fascinerende og forførende roman. Nielsen er en stor stilist. Well written. Enjoying it but due at the library. Other hight priorities right now; I may get back to it. I got carried away by a mysterious swirl, but more than often landed in a pretentious swamp. It oscillated. I wanted to hate it (couldn't do), then wanted to love it (couldn't either). Then I lost interest. It is not the bite in the apple that makes the Fall. It is the idea of a life after this one-and-only now. This rhapsodising, meandering flight-of-fancy of a book is loosely a romance. Not so much a romance between two people - although that is meant to be the nucleus of the story - but really a romance of the imagination. It’s about that one season when emotion and beauty align; a time so intense that an end to it seems inconceivable; and in some sense, it does endure as a forever golden memory It is not the bite in the apple that makes the Fall. It is the idea of a life after this one-and-only now. This rhapsodising, meandering flight-of-fancy of a book is loosely a romance. Not so much a romance between two people - although that is meant to be the nucleus of the story - but really a romance of the imagination. It’s about that one season when emotion and beauty align; a time so intense that an end to it seems inconceivable; and in some sense, it does endure as a forever golden memory (a sort of nostalgic touchstone which never loses its potency). If you can enter into the mood of the book, it does have its moments of pleasure. But if insubstantial characters, no plot whatsoever, and a total lack of organising guideposts (no chapters, for one thing) bother you enormously, I would skip it. an unsettling daydream, like falling asleep on top of the sheets and waking up just after the sun has set to an empty blue world-- the endless summer is never and forever, the romantic and feverish crux of this almost-cautionary tale of an almost-family giving themselves up to pointlessness. "Der endlose Sommer" ist die vielleicht beste Erzählung aus 2018, weil der Erzählstil, der aus Monstersätzen besteht, die sich rhythmisch über mehrere Seiten schlängeln, den Leser in einen rauschhaften Zustand versetzt und der keineswegs so außergewöhnlichen Story mitsamt ihren Figuren ein mythisches Licht einhaucht, wie man es selten erlebt. Keine Frage; Madame Nielsens "endloser Sommer" besitzt die sprachliche Kraft und die Sogwirkung eines Patrick Süßkindes. A poignant and atmospheric look at the moment in life when everything is possible. The book slip-slides like crazy through time, which I loved. The rather ‘distant’ voice of the narration sometimes grated but overall it developed a cadence that I found haunting. Usually "ethereal quality " would have mostly good connotations for me, but this just felt gauzy and intangible. Couldn't get much sense of story. Das ist sicherlich ein besonderes Buch, sprachlich herausfordernd, ein Buch wie ein langer Satz, die Geschichte beeindruckend, phantastisch, schön. Und doch war ich beim Lesen und danach irgendwie unbefriedigt. Die schön-phantastische Geschichte leidet unter der schön-lyrischen Sprache. Ich hätte gerne mehr über die einzelnen Personen und vor allem über den (nicht-direkt-Ich-)Erzähler erfahren. Breathless writing, quietly powerful - and, ultimately a mesmerizing reading experience! Read this book! I stopped around the 50 page mark because I just didn’t get it. “the endless summer” where time does not exist and space spreads and fills everything. The Endless Summer is a very atmospheric, lyrical, and, at some points, disorienting reflection on childhood, love, gender, friendship, family, and grief. The titular “endless summer” seems to refer to a profound emotional experience, a kind of turning point, that the narrator wants to preserve in detail. I chose this book as one of my reads for Women in Translation Month because I was intrigued by the title. I chose this book as one of my reads for Women in Translation Month because I was intrigued by the title. It instantly made me reminisce about some of my childhood summers when days truly felt almost endless until I was usually caught off guard by the bitter realisation that it’s the last week of August. Maybe it’s because I live in a country where we experience all four seasons very distinctly, but there is something about summer in particular that provokes in me these profound feelings of nostalgia. […] life is a dream, a dream from which you never wake up, but which one day is nonetheless suddenly long since over, but you’re still here and can either use “the rest of your days” to forget and “get on with it” or on the other hand, like me, abandon what is and try to retrieve what was, even the tiniest little thing that has been lost, even what perhaps didn’t really exist but nonetheless belongs in the story, call it forth and tell it so it doesn’t vanish but on the contrary now at last becomes real and in a way more real than anything else. The Endless Summer reads like a Proustian attempt to retrieve certain intense past memories, to bring them to the forefront, and recapture the feelings connected to these memories. To recreate a pivotal moment from the past after which your life had irrevocably changed. If you are a reader, who mostly enjoys reading books that have a distinct plot and/or character development, I recommend skipping this one. This novel mainly focuses on evoking an atmosphere and vividly capturing certain emotions, some of which are hard to describe. It’s also about how we tend to romanticise and intentionally misremember some events or experiences from our past so that we can seek comfort in these memories in the future. In the case of this novel, the narrator continues to daydream about the lazy summer days that he spent at a white farmhouse with the family of a girl that he had met. These memories of “the endless summer” are like a butterfly preserved in a piece of amber that the narrator carries like a prized possession throughout life. The novel has a very ethereal quality that is hard to explain; it’s like the narrative follows a kind of Lynchian dream logic, and the beautiful, stream-of-consciousness writing only adds to the feeling that the story is not anchored to any particular place in time. The young boy, who is perhaps a girl, but does not yet know it. Reads as if one were under the influence of a hallucinogenic drug. Soft, lazy, long long sentences, almost paragraphs. A mother births a daughter at 16; the husband Jesper is not the father. Biological dad Jacob was a one time fling and who Christina resembles. This is a pseudonym for Claus Beck-Nielsen.